IN the matter of a formal investigation held at the Debts Recovery Court, Glasgow, on the 15th and 16th days of August, 1906, before MARK GEORGE DAVIDSON, Esquire, Advocate, Sheriff Substitute of Lanarkshire, assisted by Captain KENNETT HORE and Commander GEORGE MASSEY, R.N.R., into the circumstances attending the stranding of the British steamship "KING CADWALLON," of Glasgow, on or near Lewis Rock, Scilly Isles, on or about 22nd July, 1906. The Court, having carefully inquired into the circumstances attending the above-mentioned shipping casualty, finds, for the reasons stated in the Annex hereto, that the cause of the stranding and loss of the vessel was the careless and negligent navigation of the master in continuing a S. 34 W. course after 2.40 a.m. of the 22nd July, when it was impossible to ascertain or verify the position of the vessel on account of the state of the weather. The Court, therefore, suspends the certificate of the master, Mr. George Mowat, numbered 034939, for the period of three months from this date. Dated this 16th day of August, 1906. The Court recommends that the master be granted a mate's certificate during the suspension of his certificate as a master. This inquiry was held at the Debts Recovery Court, County Buildings, Glasgow, on the above-mentioned days, when Mr. J. Morton, writer, appeared for the Board of Trade, Mr. Stout for Captain Mowat and the chief officer, and Mr. H. B. Fyfe watched the case for the owners. Henry Horton Goss, second officer, was a party to the inquiry, but was not represented professionally. The "King Cadwallon," official number 113915, was a screw steamship, built of steel in 1900, at Port Glasgow, by Messrs. A. Rodger & Co. She was registered at Glasgow, and was 3274.76 tons gross, and 2126.01 tons register tonnage. Her dimensions were: Length, 326.2 ft.; breadth, 48 1 ft.; and depth, 27.35 ft. She had one set of triple expansion engines, two steel boilers, made by Lindsay, Bennett & Co., Govan, working to a pressure of 160 lbs., and giving a speed of nine knots per hour. She was owned by the King Line, Limited, whose place of business was 165, St. Vincent Street, Glasgow, and George Metcalfe Dodd, of 9, Gracechurch Street, London, E.C., is designated the person to whom the management of the vessel is entrusted by and on behalf of the owners, advice received 27th day of July, 1904, with the seal of the King Line, Limited. She had two masts and was rigged as a fore-and-aft schooner. She had three compasses, the standard on top of the chart room, by which the vessel was navigated, the steering on the bridge in front of the wheel house, and the third on the poop in front of the steering wheel. These were last adjusted by Messrs. Ainsley & Co., of South Shields, before the master joined the vessel, but he could not tell the date, and he stated in evidence that the deviations were small, under 1° on the south-westerly courses, and that he ascertained the errors from time to time by observations of the north star and the sun. She had two lifeboats and two gigs, and six lifebuoys and 34 lifebelts &c. in conformity with the regulations, and was well fitted and equipped in all respects for the voyage on which she was engaged. She was in command of Mr. George Mowat, who holds a certificate of competency No. 034939, and was on a voyage from Barry to Naples with a cargo of 5,042 tons of coal. She had a crew of 27 hands, all told, and her draft on leaving was 22 ft. 5 ins. forward and 22 ft. 6 ins. aft. The "King Cadwallon" left Barry on 21st July at 8 a.m. at high water, the weather hazy, and the wind light from the S.W. The master was provided with Admiralty charts, corrected up to 1902, and Admiralty sailing directions, quite new, a Walker's patent log, and a Dobie's patent sounding machine, and a list of lights and fog signals corrected up to date. Approaching Lundy Island, the weather set in thick but cleared for about half an hour, when the land was seen and a four-point bearing was taken of the lighthouse, and a cross bearing of the lighthouse and the end of the land, which placed the vessel about one and a quarter miles off the lighthouse, the latter bearing N.W. by N. when it was abeam at 2.40 p.m. The course was then set S. 56 W. by the standard compass, which was estimated to be almost correct magnetic, the last observations taken on the previous voyage having shown 1/2° deviation only. The patent log was set, the speed being about 6 to 6 1/2 knots per hour, the engine telegraph placed at "stand by," and the fog whistle sounding at regular intervals, no allowance being made for tide or currents as it was not considered necessary. This course was continued at the same speed until 2.40 a.m., soundings being taken with the patent lead, sometimes twice an hour. Nothing was seen or heard during that time, except the whistles of passing vessels, and the master remained in charge on the bridge, assisted by the first and second officers in their respective watches, and a man on the look-out forward. The master expected by steering this course to pass about 3 1/2 to 4 miles off Pendeen, and 4 to 5 miles off the Longships. At 2.40 a.m. a sounding was taken, and 32 fathoms was reported to the master bottom sand and shells. The patent log showed 77 miles, and the course was altered to S. 34 W. by compass, which was estimated to be correct magnetic. At 4 a.m. the second officer came on deck to relieve the bridge and the chief officer, before going below, took a cast of the lead, which gave 27 fathoms and which he reported to the master at 4.15. At 4.30 the second officer took another cast, which also showed 27 fathoms, and again at 4.50 a third cast of 27 fathoms, both of which were reported to the master in due order. The S. 34 W. course was, however, continued, although it was impossible, from the state of the weather and the similarity of the soundings, to determine or verify the position of the vessel, and having run from 2.40 a.m. a distance of about 16 miles, she suddenly (and without anything having been seen) struck the rocks heavily at 5.3 a.m., heeled over, and remained fast. The engines were at once stopped and reversed full speed astern, but all efforts to move the vessel failed. The water was now washing over the foredeck, and the master ordered the lifeboats to be got ready. Seeing that nothing could be done to save her, and that she might slip off and founder in deep water, the boats were lowered, and all hands got into them and stood by, the cord of the steam whistle being tied to the rail so as to attract attention, the master, believing that they had stranded on the Cornish coast. Somewhere about 8 a.m. the fog became less dense, and a rock about 100 feet high was seen nearly a quarter of a mile off. The master then landed in one of the boats to get assistance, and found that the vessel had stranded on the Hard Lewis Rocks, Scilly Islands, about 13 miles to the westward of where he had supposed her to be at 5 a.m. 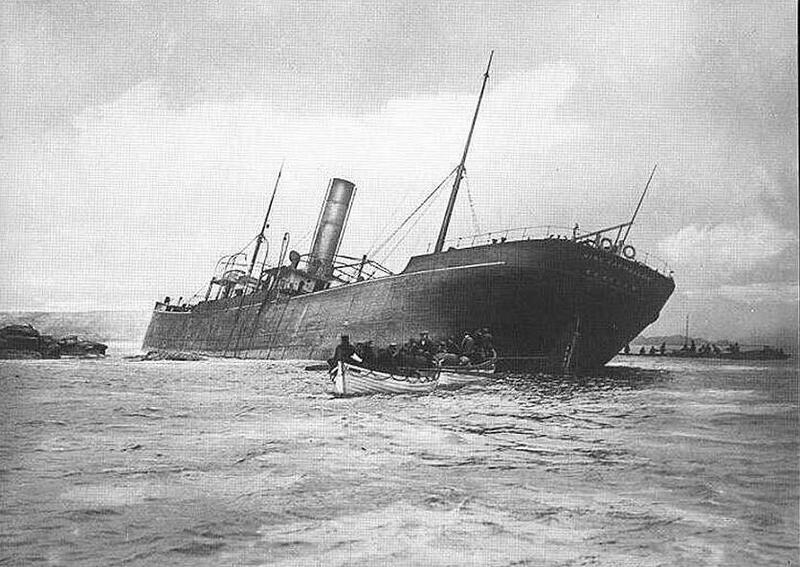 The master having seen Lloyd's Agent and telegraphed for assistance, returned to the ship about 11 a.m., by which time she had heeled over so heavily that she was nearly under water forward, and as they could see there was no possibility of getting her off, all hands pulled on shore. The master and salvage agents and officers again came off during the afternoon, but finally left her a total wreck at 7 p.m. The evidence of the chief and second officers corroborates the master's statements in these particulars. From these facts it will be seen that the "King Cadwallon" was stranded and lost through the want of ordinary care and common prudence on the part of the master in continuing a course to the southward and westward after 2.40 a.m. of the 22nd July, when he could neither ascertain or verify the position of his vessel on account of the fog. She had at 2.40 a.m. run 77 miles by the patent log from Lundy Island, and was in safety, and as the fog still continued and it was impossible to determine the actual position by sight, sound, or the lead, from the similarity of the soundings, the vessel's head should have been turned round, and the speed of the engines reduced to steerage way only; instead of which the master still proceeded to the southward and westward under the idea that he would see or hear something before any danger to the vessel occurred, and thereby failed to use the ordinary care and proper precaution of a seaman in navigating a vessel in thick weather. Q. (1) What number of compasses had the vessel, were they in good order and sufficient for the safe navigation of the vessel, and when and by whom were they last adjusted? A. The vessel had three compasses, they were stated to be in good order and sufficient for her safe navigation. They were said to have been last adjusted by Ainsley, of South Shields, some time previous to the master joining the vessel on the 1st September, 1905, but there is no evidence to show on what date they were actually adjusted. Q. (2) Did the master ascertain the deviation of his compasses by observation from time to time, were the errors correctly ascertained and the proper corrections to the courses applied? A. The master stated that he did ascertain the deviation of his compasses from time to time, and that the errors found were correctly ascertained and properly applied to the courses steered, but that after the vessel left Barry on July 21st and up to her stranding on the 22nd, there was a dense fog, which rendered it impossible to ascertain if there was any deviation on the courses steered or not. Q. (3) Was the vessel supplied with proper and sufficient charts and sailing directions? A. The master stated that he had the Admiralty charts and the Admiralty sailing directions of the west coast of England, also the lights and fog signals of the world up to date, and these were sufficient for the safe navigation of the vessel. Q. (4) Were proper measures taken to ascertain and verify the position of the vessel at or about 2.40 p.m. on the 21st July last, was a safe and proper course then set and thereafter steered, and was due and proper allowance made for tide and currents? A. Proper measures were taken to ascertain and verify the position of the vessel at 2.40 p.m. of the 21st July. She was at that time off Lundy Island, and a four point bearing was taken of the lighthouse and cross bearings of the land. The position of the vessel was found to be S.E. by S. of the lighthouse, 1 1/4 miles distant. A safe and proper course was then set, viz., S. 56 W., no allowance was made for tide or currents because it was not considered necessary. Q. (5) Was a safe and proper alteration made in the course at or about 2.40 a.m. of the 22nd July last, and was due and proper allowance made for tide and currents? A. Had the course been made good from Lundy Island and the vessel been in the position the master supposed her to be at 2.40 a.m. of the 22nd July, the alteration made in the course at that time would have been a safe and proper alteration. No allowance was made for tide and currents because it was not considered necessary. (b) Was the lead used with sufficient care and frequency? A. (a) Having regard to the state of the weather, the vessel was not navigated at too great a rate of speed up till 2.40 a.m. of the 22nd of July. It was then necessary to turn her round, keeping speed sufficient for steerage way only, as it was impossible to ascertain or verify the position of the vessel on account of the fog and the similarity of the soundings. (b) The lead was used with sufficient frequency, but the similarity of the soundings would render it impossible to determine the actual position of the vessel by the lead alone. Hence the precaution required of turning her round when she had run a safe distance, considering that nothing had been seen or heard since leaving Lundy Island. Q. (7) Was a good and proper look-out kept? A. A good and proper look-out was kept. Q. (8) What was the cause of the stranding and loss of the vessel? A. The cause of the stranding and loss of the vessel was a S. 34 W. course being continued for about 16 miles after 2.40 a.m. of the 22nd of July, when it was impossible to ascertain or verify the position of the vessel on account of the state of the weather. Q. (9) Was the vessel navigated with proper and seamanlike care? A. The vessel was not navigated with proper and seamanlike care after 2.40 a.m. of the 22nd of July. Q. (10) Was the loss of the s.s. "King Cadwallon" caused by the wrongful act or default of the master, chief and second officers, or of any of them? A. The loss of the s.s. "King Cadwallon" was caused by the default of the master alone. Neither the chief officer or the second officer are to blame for the casualty, and the Court suspends the certificate of the master, Mr. George Mowat, No. 034939, for the period of three months from this date.